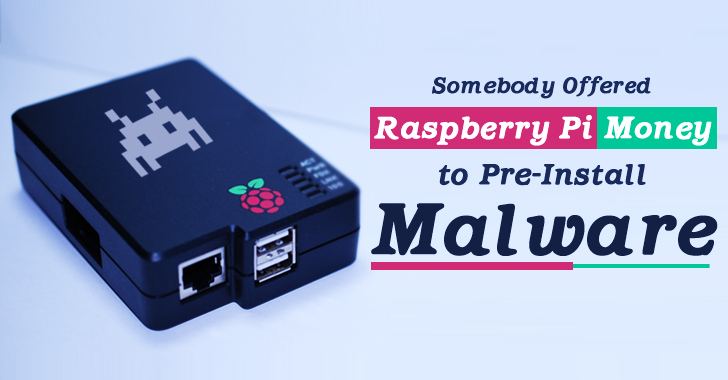 The Raspberry Pi is now gaining attention from malware distributors who want the popular mini-computers to deliver with pre-install malware. The Raspberry Pi Foundation has made a shocking revelation that the charitable foundation has been offered money to install malware onto the Raspberry Pi machines before they were shipped out to users. The Raspberry Pi is an extremely simple computer that looks and feels very basic, but could be built into many geeky projects. Due to the low-cost appeal of the Raspberry Pi, the Foundation has sold over 4 million units. Just Last month, Raspberry Pi unveiled its latest wonder: The Raspberry Pi Zero – a programmable computer that costs just $5 (or £4), may rank as the world's cheapest computer. 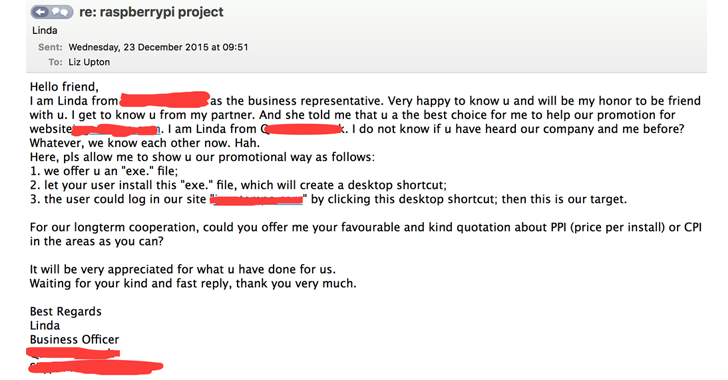 Last Wednesday, the Foundation tweeted a screenshot of an email in which "business officer" Linda effectively asked Foundation's director of communications Liz Uptonto to install a suspicious executable file onto Raspberry Pis for which the officer promised to offer a "price per install." The email further explained that installing the executable file would create a shortcut icon on the user's desktop and opening the shortcut would take the user to the company's website. "Then this is our target," the email reads. However, the name of the company represented by Linda was not revealed by the Raspberry Pi Foundation. Obviously, the paid-for-malware distributor pitched the wrong organisation, who declined the offer, describing the company as "evildoers," but the incident once again raises the question about this common, widespread issue.